London: Macmillan, 1893. First edition, first printing hardback in rare dustwrapper. Bound in the original red cloth with gilt titling to spine and decorative roundel to both boards. All edges gilt. 19 × 13cm, xxxi + 423pp + 5pp ads for Lewis Carroll's works. This copy also includes the original handbill Advertisement from Lewis Carroll dated Christmas 1893 expressing his displeasure of the publisher's lack of illustrations in the most recent Alice in Wonderland, and requests that anyone having a copy should send it to Macmillan for a replacement of the next edition. 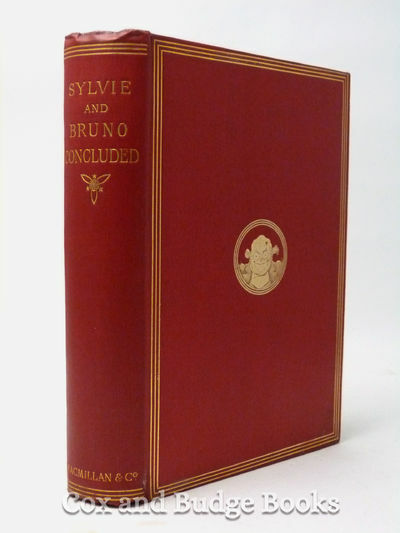 This is the sequel to Lewis Carroll's Sylvie and Bruno (1889), his storyof two fairy chldren, and was his last novel to be published in his lifetime. Illustrated with forty-six drawings by Harry Furniss. Although unsigned, this book comes from the London library of Professor Morton N Cohen, the pre-eminent Lewis Carroll scholar and I can provide a signed letter to this effect. Condition: The book is in very good condition. The red boards are clean bar a little rubbing along the edges, and the gilt page edges are crisp. The inner binding is secure and the pages clean though a little tanned and with a few isolated spots of foxing. The dustwrapper suffers loss to top and bottom and is tanned to the spine. The handbill is creased to one side and the bottom.. First Edition. Hardback. Very Good/Fair.